I have a soft spot for bite-size food that can be dipped into a tasty sauce during Mardi Gras feasting. There’s a lot to love about a dip-and-munch treat when gathering with family and friends. Mardi Gras season is upon us with many opportunities for crowd pleasing treats, and these sausage bites are frequently on my menu. The weeks leading up to Mardi Gras can be fast paced and sausage bites are a great make-ahead treat. Simply transfer them from freezer to oven (with a quick egg wash and seed topping), and you’ll have sausage bites in minutes. 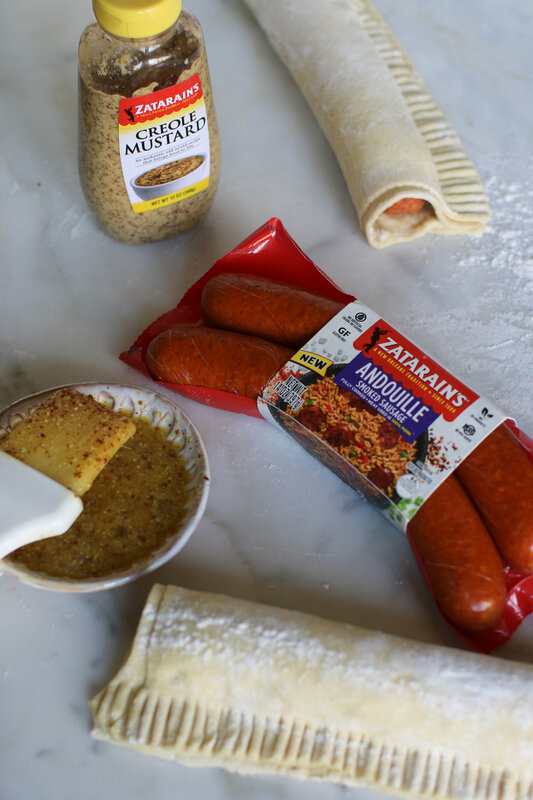 You’ll enjoy making these with Zatarain’s fully cooked sausages because this Cajun brand really amps up the flavor factor in these easy to prepare treats. 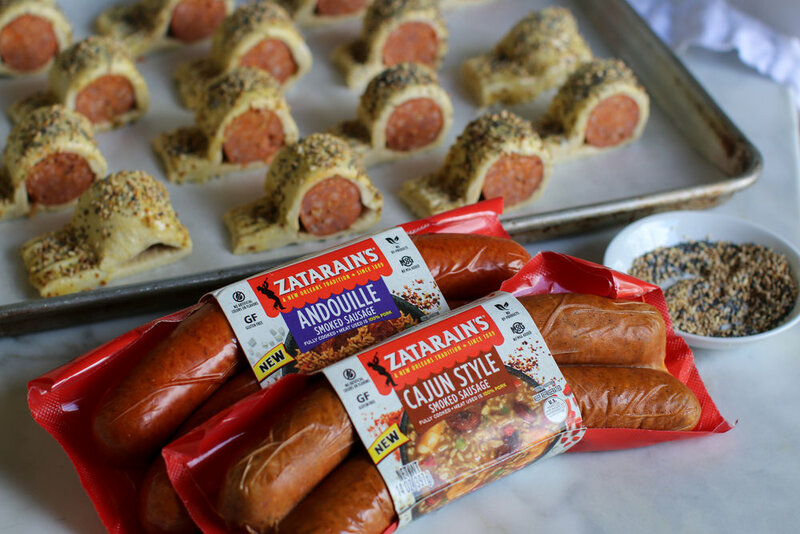 The tough part is having to decide whether to make these bites with Zatarain’s Cajun Style smoked sausage or their Andouille smoked sausage. Sausage bites must have a dip, and you’ll whip up this creamy dip in a matter of minutes with a pop of flavor from Zatarain’s Creole mustard. 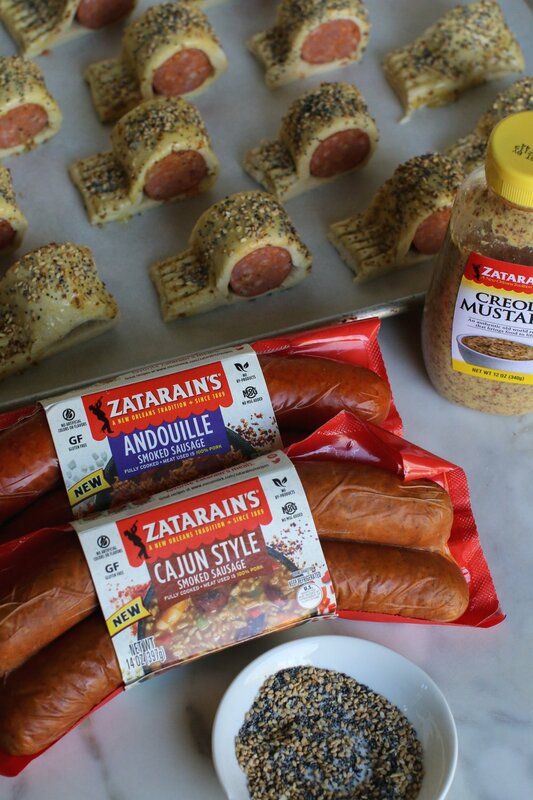 While you’re at your local Rouses Market stock up on your Zatarain’s Andouille and Cajun Style Smoked Sausage, and don’t forget to grab a few packs of puff pastry, too. They’re delicious when added to a party platter. Click here for a Zesty Party Platter. I can’t wait to see your version of these fast and flavorful treats! Share your photos by tagging me on Instagram at @y_delicacies. Laissez les bon temps rouler! 1. Line a baking sheet with parchment and set aside. 3. In a small bowl whisk together egg and mustard and set egg wash aside. 4. Cut sausage in half into two links and set aside. 5. On a lightly floured work surface, unfold one sheet of puff pastry, and dust off any flour on top of the pastry dough. Drizzle ¼ teaspoon of water on top of dough and rub water on top surface of dough. Place the second sheet of puff pastry dough on top of the moistened puff pastry and firmly press with your hands to adhere sheets together. 6. Roll puff pastry to form a 10x10 inch square. Cut in half lengthwise forming two 5 x10 inch rectangles. 7. Working with one rectangle, place one link of sausage along one long side about 1-inch from long edge. Brush the opposite half of long edge with egg wash. Fold egg washed half of puff pastry over sausage, aligning long edges. Seal the long edge with a fork. Cut into 1-inch links. Transfer to prepared baking sheet and repeat with remaining half of puff pastry and sausage. 8. Freeze wrapped sausage bites on baking sheet until pastry is firm about 20 minutes. 9. Preheat oven to 400°F. Brush entire top of chilled sausage bites with egg wash and sprinkle with the seed topping. 1. In a medium bowl, mix mayonnaise, mustard, honey and cayenne pepper until well combined. Store in an air tight container in the refrigerator up to 4 days. Do Ahead: Sausage bites can be wrapped in puff pastry, cut into 1-inch pieces and frozen up to one week ahead. When ready to bake brush with egg wash and sprinkle with topping. Bake until the bottom is deep brown and the top is golden brown, 20-25 minutes. Serve with dipping sauce which can be made up to 3 days ahead. These Cornbread Sausage Poppers will get you up and at it!